It was flagged off by Mr. Ashok Kumar, DG (Law & Order), Uttarakhand Police. 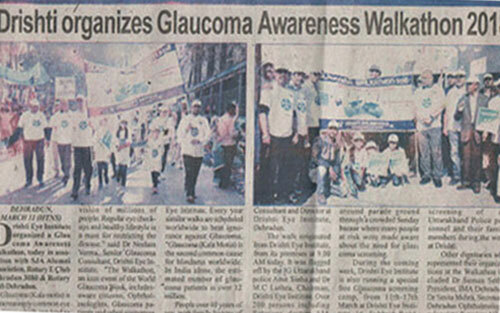 Over 200 persons including Rotarians, Doctors, SJA Alumni members and Glaucoma patients joined the walk. 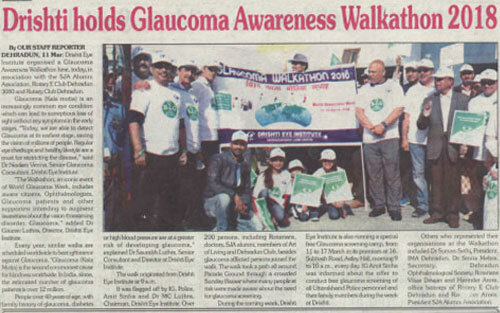 Other dignitaries who represented their organizations at the Walkathon included Dr.Sanjay Goyal, President, IMA and its Secretary, Dr.Vijay Tyagi, members of Dehradun Ophthalmological Society, Harinder Juneja, President, Rotary E Club Doon 3080, Mr Randheer Arora, President, SJA Alumni Association, Dr.Anugya Agrawal, Dr.Gyanendra Singh and Dr. M S Sekhon among others.t for the occasion was Shri. Ashok Kumar DG Uttarakhand Police. More than 200 people participated in the event. 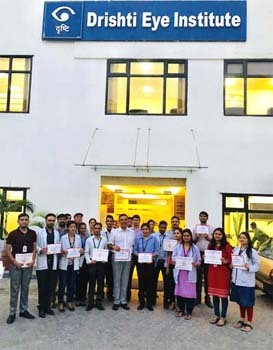 The staff members including doctors of Drishti Eye Institute came together for a cause on Gandhi Jayanti by donating blood at St Joseph’s Academy. Almost 35 employees of the eye hospital volunteered for the noble exercise. 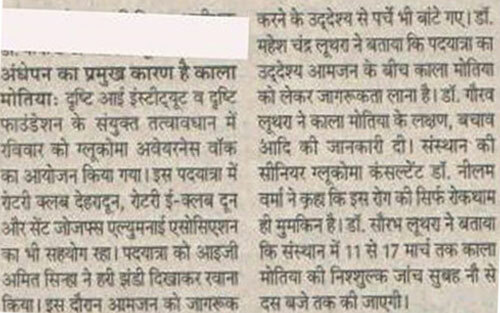 Among the donors were Dr Gaurav and Dr Saurabh Luthra, both are ex-Josephites. Blood donation is not only a superior cause but it has other benefits as it lowers the risk of ailments like Heart diseases and Cancer. Beside this, a complementary health examination in terms of blood pressure, hemoglobin levels etc is done as well. The staff was in high spirits to contribute their bit for the camp. 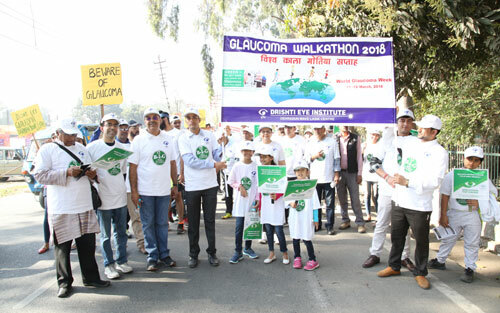 Drishti Eye Institute organized a Glaucoma Awareness Walkathon, on Sunday 11th March, 2018 under the aegis of Drishti foundation and in association with SJA Alumni Association, Rotary E Club Dehradun 3080 & Rotary Club Dehradun. 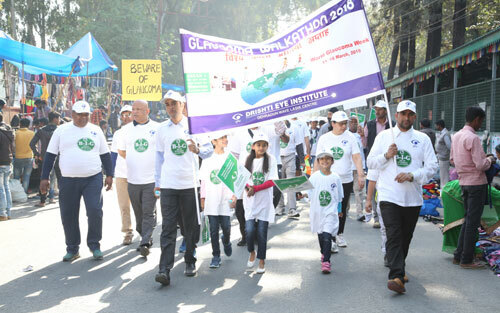 Every year similar walks are scheduled worldwide to beat ignorance against Glaucoma. "Glaucoma (Kala Motia) is the second commonest cause for blindness worldwide. 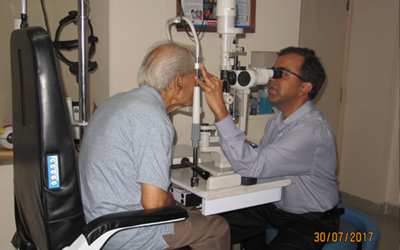 In India alone, the estimated number of glaucoma patients is over 12 million. People over 40 years of age, with family history of glaucoma, diabetes or high blood pressure are at a greater risk of developing glaucoma." explained Dr Saurabh Luthra, Senior Consultant and Director at Drishti Eye Institute, Dehradun. 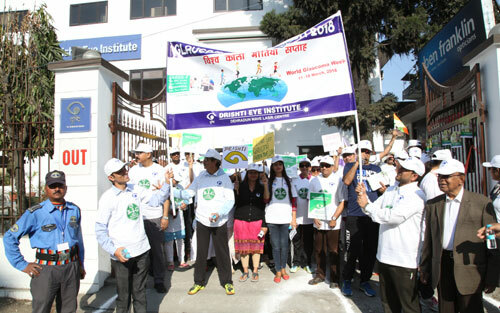 The walk originated from Drishti Eye Institute, from its premises at 9.00 AM on 11th March, 2018. 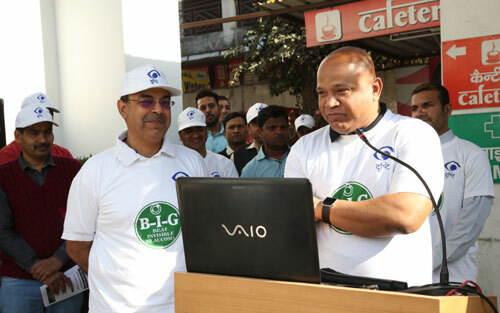 It was flagged off by the IG Uttarakhand police Mr Amit Sinha and Dr M.C Luthra, Chairman, Drishti Eye Institute. Dr M.S Sekhon, Dr Mrinal Shankar, Dr Akansha Mehrotra , Dr Priyanshi Multani and Dr Gyanendra V Singh were also present on the occasion. Uttara Eyecon- 2017, the 14th annual conference of Uttarakhand State Ophthalmological Society (UKSOS) concluded successfully at Hotel Radisson Blu Haridwar on Sunday 17th of September. The 3 day conference had almost 250 doctor delegates from Uttarakhand and surrounding states besides 40 renowned faculty from all over the country participating in scientific deliberations and wetlabs. The annual meeting of all eye surgeons of Uttarakhand was inaugurated by Shri Madan Kaushik, Cabinet minister for Urban Planning, Uttarakhand, while Dr Jagat Ram, Director of PGI Chandigarh, was the Guest of Honour for the occasion. Dr C Shekhar Grover was installed as the new President of the Society while Dr Gaurav Luthra was appointed as the Honorary General Secretary. The prestigious Dr M C Luthra, Gold Medal for best paper presentation 2017 was won by Dr Deepak Mishra, while the Dr Satanshu Mathur Best Video Award was won by Dr R P Singh. More than 200 papers were presented on various topics such as refractive surgery, cataract and retina surgery. Noted speakers emphasised on various issues such as importance of eye donation and guidelines on prevention of loss of vision from Glaucoma (Kala Motia). Dr Gaurav Luthra, Honorable General Secretary, UKSOS,said that "The Conference was a huge success with a total attendance of over 300 participants including a large trade delegation contributing their share towards eye healthcare services in Uttarakhand." Drishti Eye Institute organized its annual Conference, Drishticon 2017 recently. On Saturday, August 26th “IMA Drishticon -2017” was held at Hotel Madhuban for the doctors of Indian Medical Association, Dehradun. The theme for the IMA Drishticon-2017 was “Ophthalmology Update- What’s current? What’s new?” Several invited faculty of national repute besides the team of specialists from Drishti interacted with IMA doctors to bring out the latest in ophthalmology for their benefit. Sunday’s sessions were for eye surgeons including a “Live Surgery” session on SMILE LASIK. Dr Kumar Doctor from Mumbai delivered the Dr M.C Luthra oration on the latest advancements in cataract surgery. 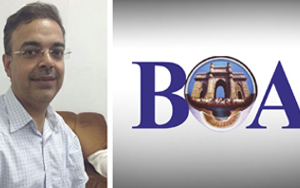 At Bombay Ophthalmologists Association’ FOCUS 2017 Silver Jubilee Conference, Dr Gaurav Luthra, President, Intraocular Implant and Refractive Society of India, was one of the 17 eye surgeons who performed live surgery at Sir JJ Hospital that was relayed at Hyatt Regency, Sahara, Mumbai. He demonstrated a new cataract surgery called ZEPTO. “The ZEPTO cataract surgery which I demonstrated today is the new surgery for cataract which has just been introduced worldwide. It has come to India first and still not available in the US. It was in trials for last 3 years but it was launched only 3 months back after all the approvals. It is called ZEPTO cataract surgery. During the live surgery, I demonstrated two things- ZEPTO and a new type of lens which is introduced recently Tridiff,” said Dr Luthra. About the surgery, Dr Luthra explained that it is a new innovation for one of the critical step of cataract called capsulorhexis. “When we do cataract surgery, one of the steps which is critical is called capsulorhexis. If you don’t have a perfect capsulorhexis you cannot put the lens properly in the eye and the result will be compromised,” said Dr Luthra. Normally capsulrohexis used to be done manually using fine needle, informed Dr Luthra. “This machine is able to give perfect rehxis. It has a success rate of 99.9%. There are two aspects of the capsulorhexis with ZEPTO. One is that it gives perfect rhexis and dependability. The other is that it is consistent and gives you 100% surety. The perfect rhexis is stronger than what you can do manually and it is affordable,” said Dr Luthra. Talking about the lens he used in the live surgery, Dr Luthra said it is a special lens called Tridiff lens. “Normally, when we put lens in the eye for cataract surgery we use monofocal lenses. With a monofocal lens all you can see is things that are at a distance. But one has to use reading glasses and computer glasses too. So after cataract surgery, people have to use bifocal or trifocal lens, which are not comfortable and many people don’t like it,” said Dr Luthra. He said the whole aim of doing cataract is to give good vision. “Now, there are three focuses that is near intermediate and distance. And Tridiff lens has all 3 focuses in it. Which enables people to read, work on a computer and see at a distance without glasses.Tridiff is advanced technology lens made in India and exported worldwide,” said Dr Luthra. Drishti Eye Institute on Sunday 30th July 2017 conducted a ‘Free Diabetic Retinopathy’ Screening camp for persons suffering from diabetes. The camp started in the morning from 10 am at Drishti eye institute. More than100 Diabetic patient’s eyes were screened and 15 patients were detected with Diabetic retinopathy by Retina specialist of Drishti Eye Institute. Due to lack of awareness in eye diseases and poor affordability, many patients are unable to get the right treatment on time. 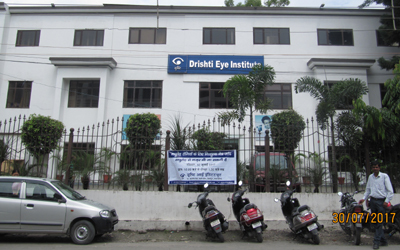 Drishti Eye Institute regularly organizes various camps & programs for patients suffering from eye diseases. In this camp also Drishti’s Retina specialists have detected 15 diabetic retinopathy patients and were able to save their vision by giving the right treatment on time. Diabetic Retinopathy is an eye condition triggered by diabetes, leading to vision threatening damage to the retina. People with both diabetes and high blood pressure are even more likely to be affected by this disorder. Among the doctors present for the camp were Dr MC Luthra, chairman Drishti group, Dr Saurabh Luthra, Director & Senior Retina Consultant, Dr Mrinal Shankar, Dr Aditya Bansal .They were assisted by a team of optometrists from Drishti Eye Institute. A free eye checkup camp was organized at Gurudwara Poanta Sahib by Drishti Foundation, Dehradun and Rotary E-Club Doon. According to the event organizers, more than 300 poor patient’s eyes were examined by the eye specialists of Drishti Eye Institute, Dehradun. The camp started in the morning and concluded in the afternoon with visitors being provided with the organizers facilitating examination, counseling and distribution of free medicines for the camp patients. Among the doctors present for the camp were Drishti group chairman Dr MC Luthra, Dr Gaurav Luthra, Dr Neelam Verma and others.